Sorry KD (Kevin Durant), it’s not your sweet mother this year. The NBA MVP race is a lot closer this year than it was the previous year when KD was the clear standout. Last season, he averaged a league leading and career high 32 ppg, 5.5 assists, and 7.4 rebounds. The only other MVP candidate, Lebron James, averaged 27 ppg on 56% shooting, 7 rebounds, and 6.4 assists. Great numbers, but KD’s were just better. It’s not that simple this season, however. Russell Westbrook, Lebron James, James Harden, and Stephen Curry are the four players in the MVP discussion, but only one will take the title. Westbrook tore it up this season having averaged career highs in rebounds (7.2), assists (8.6), and points (27.9), which leads the league. Westbrook also tallied 28 thirty-point games and a league leading 11 triple-doubles that all came starting January 16th. Oh yeah, he also missed 15 games early on. His numbers are eye popping and he took his game to another level this year, but the Thunder are on the verge of possibly missing the playoffs. And to the media, the people who vote for MVP, a team’s success is key to winning an MVP so no playoffs would mean no MVP for Westbrook. At least he has the All Star game MVP trophy to cuddle with. Next up is Lebron James. In his first season back in Cleveland, Lebron averaged the lowest ppg (25.3) since his rookie season. He did however post his second highest assist average (7.4) to go with six rebounds a game. Typical Lebron numbers but they just don’t shout MVP. After Cleveland’s slow start, Lebron has turned the Cavs into a favorite from the East with the help of Kyrie Irving and mid-season acquisitions J.R. Smith and Timofey Mosgov. Don’t get me wrong, Lebron is still the best player in the league, but he didn’t wow anyone this season. Sorry Lebron. And then there were two: The Bearded One and Chef Curry. Harden and Curry have been cooking on the court all year long making them the front runners for MVP. Harden has had the best season of his career thus far as he is second in the league in scoring (27.5 ppg), averages 7 assists per game and 5.6 rebounds. His MVP caliber season has also consisted of thirty-five 30-point games, ten 40-point games and two 50-point games. Harden’s offensive consistency has lead Houston to the fifth seed in the West, which can become a two or three seed within the last few days of the regular season. 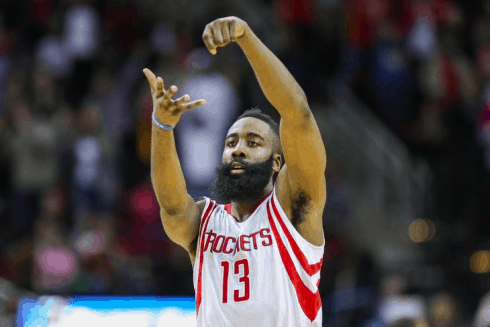 One of the main arguments being made for Harden is that he is the player who is most valuable to his team. The Rockets have been plagued with injuries throughout the season as Dwight Howard, Patrick Beverley, and now Donatas Motiejonas have all missed a significant amount of games. Harden has carried the team on his back through all the injuries and put them in a position to win nearly every game. Take away Harden from the Rockets-even with a healthy team-and they probably don’t make the playoffs. Harden has been superb but he’s got some competition. 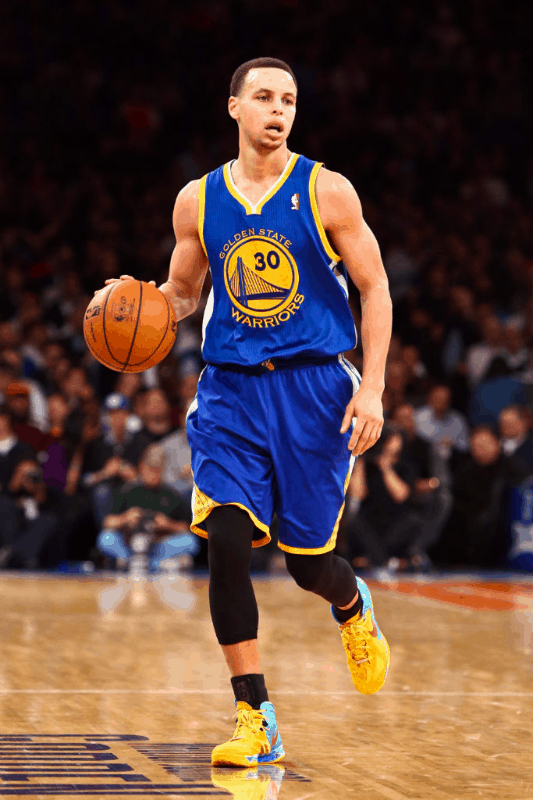 Stephen Curry is arguably the most exciting player to watch in the NBA. Averaging about 24 ppg, 7.7 assists, and 4.3 rebounds while hitting almost four threes per game, Curry has dazzled the world with his incredible shooting displays and circus shots nearly every time he stepped on the court. He led the league in 30 point-10 assist games and broke his previous NBA record for most threes in a season, previously 272, now 284, with one game remaining. We know Curry can light it up, but it’s improvement on defense that gives him a slight edge over Harden. The biggest argument being made for Curry is the ever so common phrase, “The best player on the best team.” Curry has the Warriors atop the league at 66-15. They have broken numerous team and league records and are being picked by many to win it all this year. However, some of the voters are arguing that the team’s success is largely because they have a loaded roster, which is true. But Curry is the leader of that team and they wouldn’t be a one seed without him. The MVP race is tight and could be decided by a few votes. One thing is for sure though, either James Harden or Stephen Curry will take home the hardware. Anyone who votes for someone other than these two hasn’t watched enough basketball this season to know that Harden and Curry have been great and are the only players that have a chance of winning MVP. I’m pulling for Curry but I know this can go either way. I guess I’ll just have to wait and see like everyone else!